Myre, a picturesque town located in northwestern Norway is as remote as can be, and is also one of the largest fishing villages in the country. I was invited to Myre, aka the capital of SKREI®, to report on the seasonal fishing of this iconic migrating Norwegian cod, only available from January to April each year. 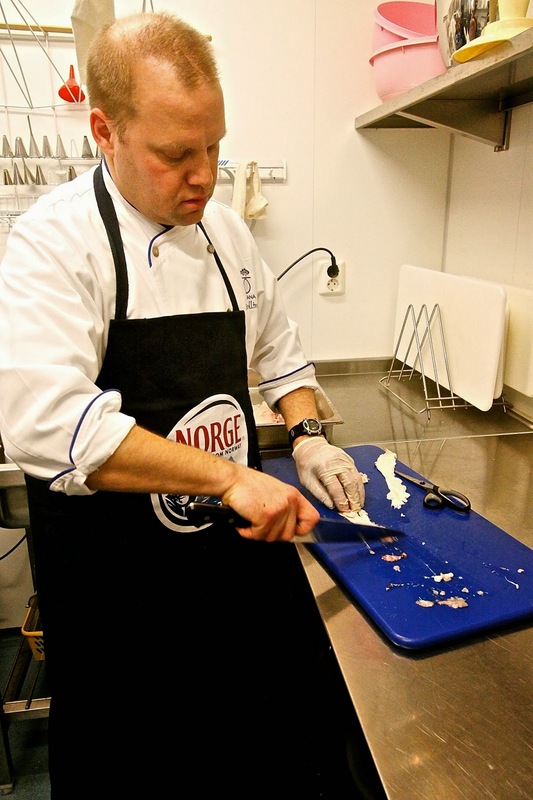 #SKREIPassion2014 was an initiative by the Norwegian Seafood Council, bringing 7 international chefs and 7 journalists to Myre, Norway to learn more about SKREI®, fish for it, cook it and eat it. How could I refuse! 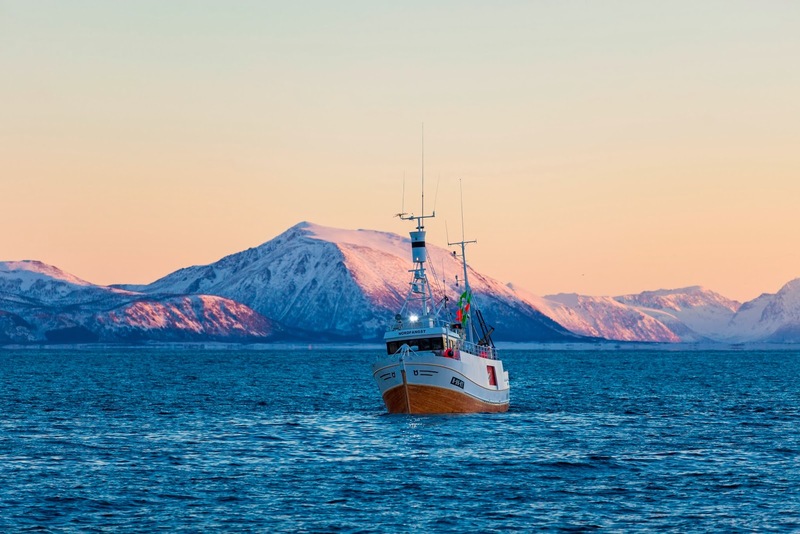 From the world’s largest cod stock that lives in the Barents Sea, cod reaching maturity at the age of 5 years will spend the winter months migrating thousands of miles to their birthplace to spawn along the northern coast of Norway. This cod, in the prime of its life, is known in Norway as SKREI®. Migrating over vast distances, the flesh of these powerful fish becomes exceptionally firm, white and supple, which makes the fish lean and tasty, and guaranteed to be of the highest quality. 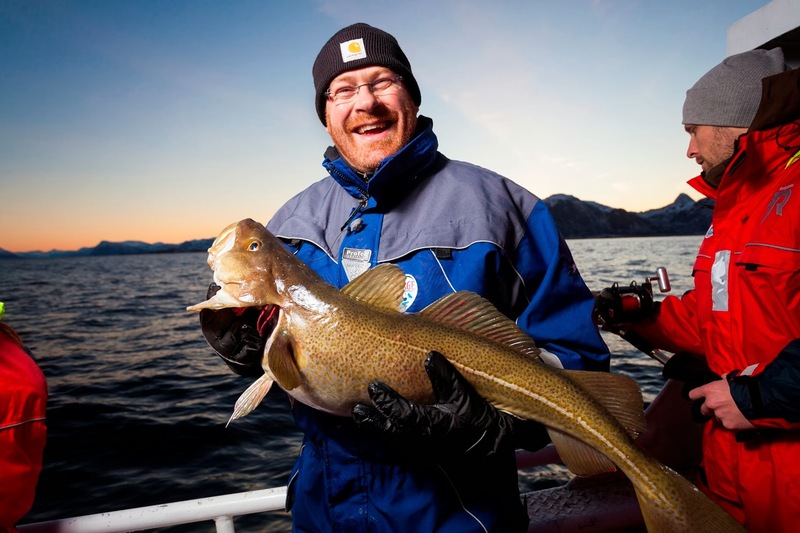 Not every Norwegian cod fished during the seasonal migration can be labeled SKREI®. In fact, only 10% of Norwegian cod is graded as SKREI®. Strict quality standards are applied to guarantee that only the very best are so labeled. SKREI® must come from the Barents Sea, be fully grown (about 5 years old), and fished between January and April along the traditional spawning grounds of northern Norway. In addition, it must be line caught by small Norwegian fishing boats, and be in pristine condition with no scratches, bruises or other injuries. SKREI® differs from coastal cod not only in appearance (it is longer, more pointed, and lighter in colour), but also in its feeding habits. During spawning, SKREI® hardly eat, whereas coastal cod eat all year round. As a result, SKREI® has a leaner, firmer consistency and the meat is very white. Two flights from Oslo and a coach journey later, we arrived in the town of Myre to take part in a SKREI® workshop at the local chef school. 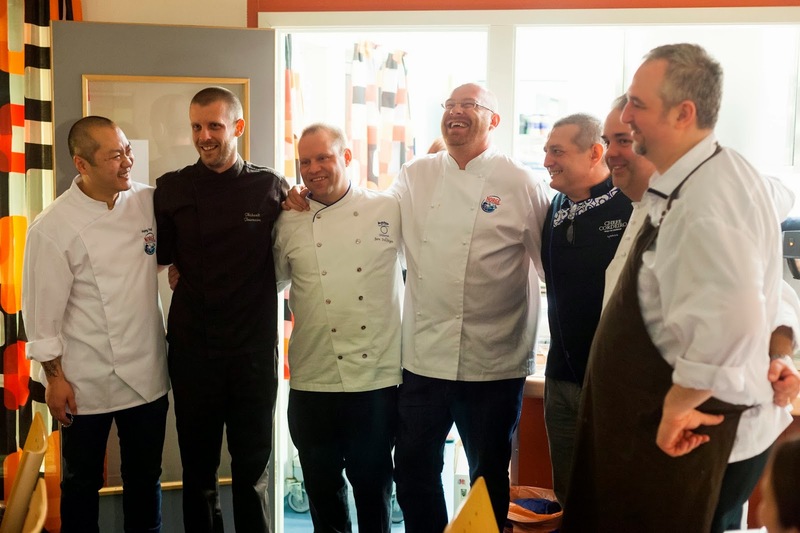 Each one of the seven international chefs was to create his own recipe using the Norwegian fish, combined with his country’s native ingredients. 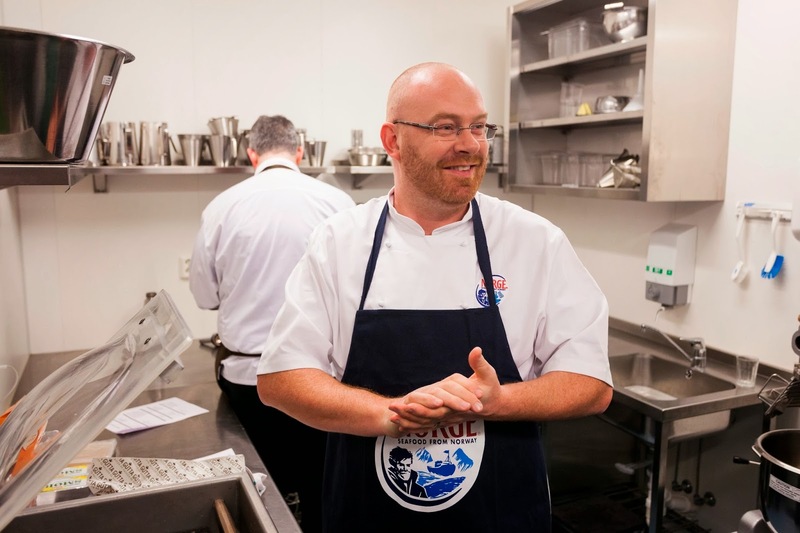 I was lucky enough to be invited to report on the UK chef Simon Hulstone, the man behind The Elephant in Torquay Restaurant, which has held a Michelin star since 2006. This was also a great opportunity for me to meet some of the other chefs who came from as far as the USA (Ben Pollinger of NYC’s Oceana Restaurant), Portugal (Jose Cordeiro of Chefe Cordeiro Praca do Comercio), and Spain (Hung Fai of Lgeretxe Hotel in the Basque country) among other countries and chefs. 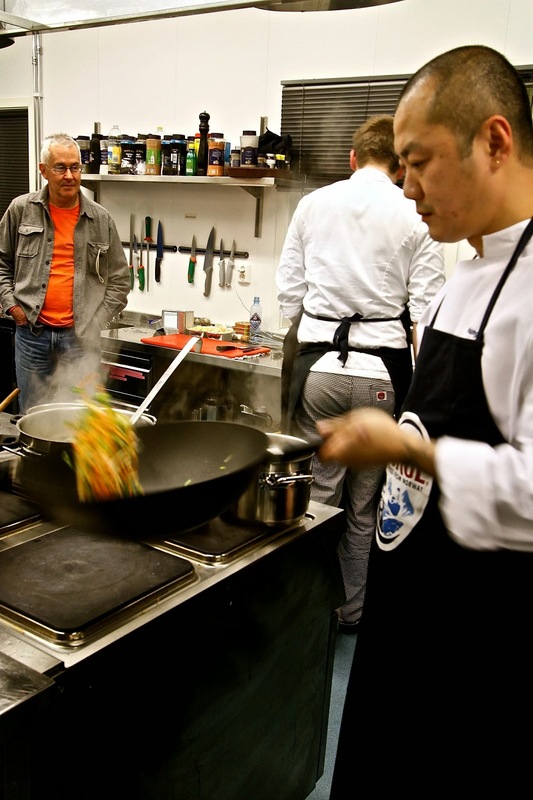 Talking of too many cooks spoiling the broth, being in a busy kitchen with 7 chefs, their assistants and journalists was an interesting if not challenging experience for most. The chefs did a brilliant job though, cooking for a full house of hungry local residents at a sit-down dinner at the cooking school hall. This was a fascinating dinner, and a wonderful chance to try all these dishes made from the same SKREI® fish, given very different interpretations, flavours and textures by the chefs. At our table of seven journalists, it was unanimously agreed that although the competition was fierce, chef Simon Hulstone’s dish was the most successful, and this is not British bias I swear! Simon served us a fillet of Norwegian SKREI® wrapped in Iberian lardo, with a creamy parsnip puree and a rich reduction of verjuice and chicken stock finished off with plenty of butter, sultanas, spring onions and cucumber. This had many layers of flavour and texture, but what brought it all together was his sauce – buttery and rich, yet refreshing, sour and sweet at the same time, a real winner! 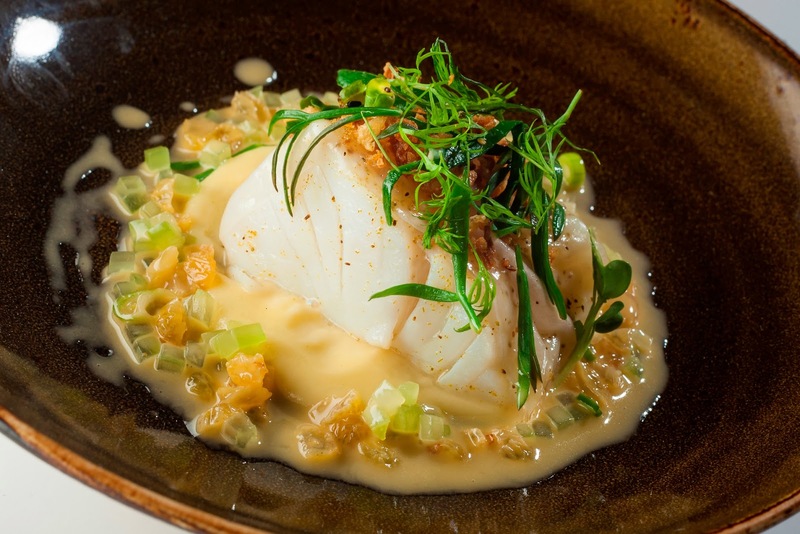 If you would like to try Simon Hulstone’s recipe for Norwegian SKREI®, I have reproduced his recipe at the end of this post. Next morning was a very early start as we went onboard a local boat to fish for SKREI®. The scenery was breathtaking, and the temperature -14°C! As tradition dictated, we all went line fishing, and Simon landed a healthy catch of SKREI® to cook back on dry land. Returning to dry land never felt so good! Fishing is the town’s major industry, and everyone is associated with it in one way or another. The youngsters and students will have their first contact with fishing through the activity of tongue cutting, for which they get pocket money through their school years and sometimes even through university. The tongues of SKREI®, and indeed almost every part of the fish can be eaten, not just the white flesh. I thoroughly enjoyed the tongue fritters on our first day, as well as trying poached liver and roe in the traditional Norwegian mølje dish that evening. Mentored by some of these students and tongue cutters, our international chefs had a competition to see who could cut the most tongues. It was striking to note that the local teenagers were faster than the Michelin starred chefs – clearly practice makes perfect in tongue cutting too. For me, the highlight of this trip was dining in a local family home for a traditional SKREI® mølje dinner. Our hosts cooked an authentic regional dish of poached fillets of SKREI® liver and roe, accompanied by boiled potatoes, flat crispy bread, butter and cranberry conserve. This was simple, delicious and wholesome, being made from the best local ingredients. The best part though was meeting and talking to local Myre residents and experiencing their generous hospitality. The local TV channels as well as the ever so helpful team from the Norwegian Seafood Council were present to support and film us throughout our stay. One of the nicest things they did was to put together this short video outlining some of the activities we participated in, which give a flavour of our time in Myre. Having never visited Norway, let alone Myre, nor having set foot on a fishing boat, and knowing little if anything at all about SKREI® until then, this trip was a fascinating experience for me and I think everyone else involved. It showed me not only what a beautiful and unspoilt stretch of Norway this is, but also all the care and attention that go into bringing SKREI® from those wild shores to our shops, restaurants and homes in the UK. If you fancy trying SKREI® for yourself, you can find it closer to home, in Harrods Food Hall, or if you live in the north of England, Booths the Fishmongers, or ask your local fishmonger. But hurry – the season finishes at the end of April. 1. For the parsnip purée, heat the butter in a saucepan and cook the parsnips for one minute on a high heat. 2. Add the cream, bring the mixture to the boil then reduce the heat and simmer for five minutes or until the parsnips are tender. Blend the parsnip mixture in a blender until smooth. 3. Pass the mixture through a fine sieve and into a clean pan, then season to taste with salt and freshly ground black pepper. 4. For the verjus butter, pour the verjus and chicken stock into a saucepan and bring to a boil, continue to cook until the volume of the liquid is reduced by three-quarters. 5. Remove the pan from the heat and whisk in the cubed butter until smooth and glossy. Season to taste with salt and freshly ground black pepper. Add the sultanas, cucumber and spring onion. Keep warm. 6. Meanwhile for the SKREI®, season the fillets with salt and freshly ground black pepper. 7. Pour 1 tbsp olive oil in a hot frying pan, add the seasoned SKREI® skin-side down and cook for 2-3 minutes, or until golden-brown. Turn the fish over and remove the pan from the heat. 8. Place the fish onto a board or a plate and place a lardo slice on each fillet and carefully sprinkle the fennel pollen, kibbled onions, chives and borage on top. 9. To serve, spoon the parsnip purée in the centre of serving plates and place the dressed SKREI® on top. Finish by pouring the sauce around the SKREI® and serve immediately. Hi Luiz lucky you you went to Norway! That was a great report and great photos too! What camera did you use? 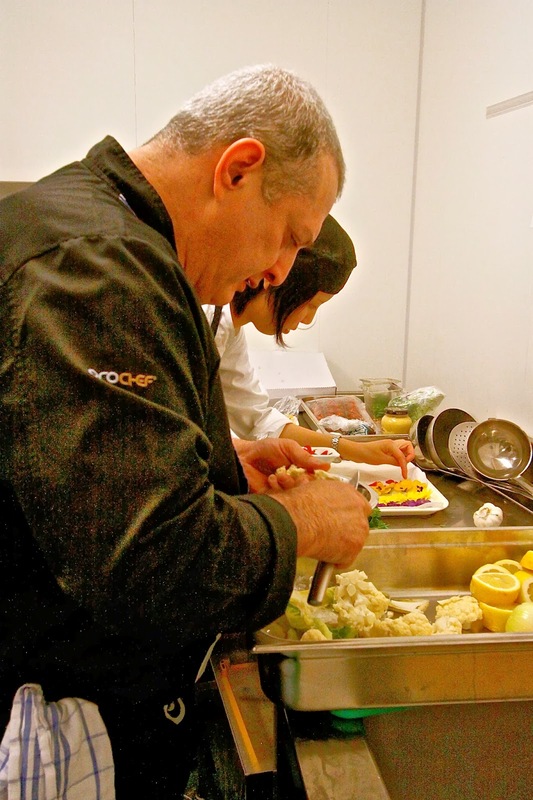 And I have to ask, as I am Portuguese, do you remember what Chefe Cordeiro cooked with his cod? In Portugal we mostly eat salted cod as you know! Cut the Skrei in cubs of roughly 160 grams each and season with salt, garlic and lemon. Let it marinate for 2 hours in the in the refrigerator. Boil the garbanzo beans with salt, the carrots, bay leaves and red onion. On a frying pan put some olive oil, the smoked ham cut in Brunoise really thin, one garlic clove and sauté the garbanzo beans. Season with salt. 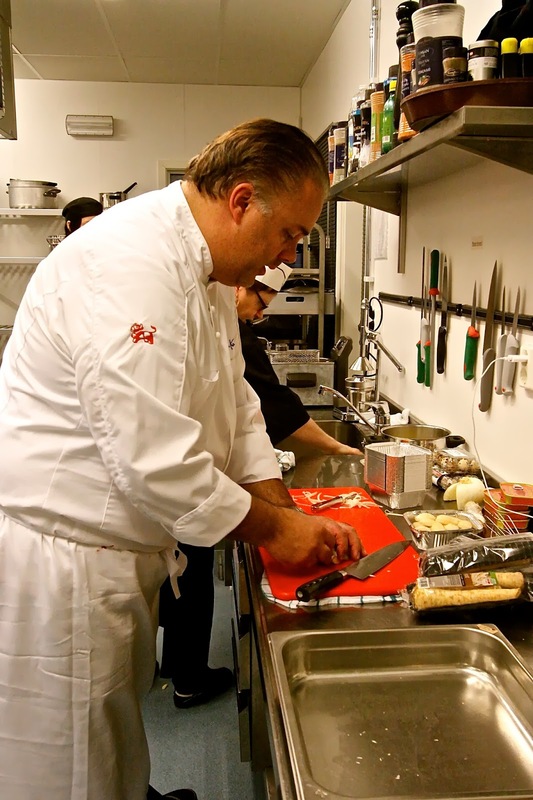 Drain and pass on TURBOMIX (or BIMBY) until a very fine puree. Add lemon juice. Reserve warm. First boil the cauliflower in milk, salt and water. Then boil the carrots in water and after the broccoli. Reserve to serve. Add 3 liters of olive oil in a pan with the bay leaves and the garlic cloves. Allow to warm to 75°C and confit the skrei for 10 to 15 minutes. After confit, slightly roasy the Skrei skin in a frying pan with really hot olive oil. Cut the tomato in Brunoise, very thin, and season with olive oil, vinegar, sal and mustard. Reserve to serve. Wash the micro vegetables and reserve to decoration. Place the garbanzo puree one a nice flat plate. Lay the Skrei Taco. Add the Brunoise Tomatos and sprinkle with the hot juices of the skrei. Serve accompanied with the boiled vegetables. Decorate with the micro vegetables and the fine petals. Fantástico! Muito obrigada. Já pus o bacalhau de molho!